London Boroughs, Metropolitan Boroughs and Non-Metropolitan Districts are divided into Wards for local elections. The City of London has its own type of Wards based on ancient and permanent sub-divisions of the City. This London Borough by Postcode product is a lookup between every Postcode in Greater London and the Electoral Ward and Districts (Boroughs) they fall within. As Postcode boundaries and administrative boundaries have no relation to each other in the normal world, this London Borough by Postcode product is ideal for those applications where you need to allocate addresses to their respective Wards and Boroughs or where you need to determine all the Postcodes falling within a Borough, Ward or District. The London Borough by Postcode data is ideal for relating Postcodes and address information to the respective London Ward, District or Borough. Therefore the data is ideal for relating residential or business addresses to council areas for public service provision or for determining all Postcodes and addresses falling within specified Wards, Boroughs and Districts. The London Borough by Postcode data covers the area of Greater London. The London Borough by Postcode data is by default emailed at the time of order using a secure download link delivery method. If you require the data supplied in another format then we will be more than happy to accommodate you where reasonable to do so at no extra cost. The London Borough by Postcode list is licensed annually for each user that has access to it according to these terms and conditions. 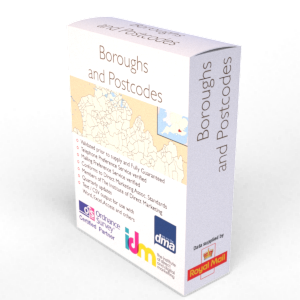 The London Borough by Postcode file is updated every three months and free updates will be made available to you so long as your licence remains current.